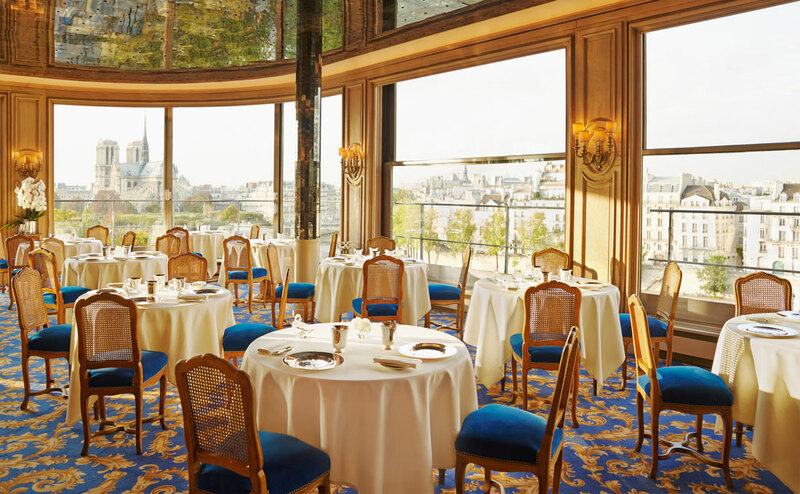 It must be said that the beauty of the place, its breathtaking view of Paris and its gastronomic table between tradition and creation make it a very popular place. In this internationally renowned establishment, the French art de vivre is erected as a major art form. From the reception, to the refinement of the decor via the exceptional quality of the dishes on offer, nothing is left to chance. Room service also has its codes. Fascinating, it demands rigor and precision. 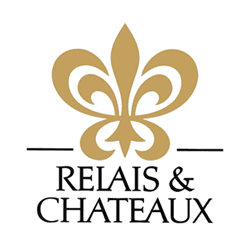 This pursuit of excellence, this attention to detail, this ceremony contributes to the renown of French gastronomy. 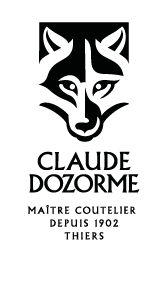 It is in this unique setting that we find the brand Dozorme. 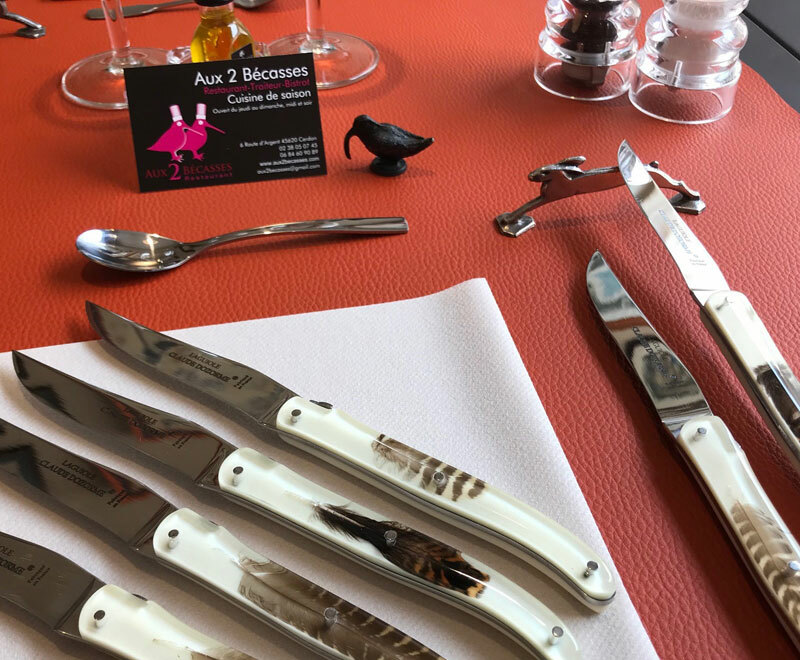 For 2 years, the cutlery industry in Thiers has collaborated with this national heritage monument for the cutting of an emblematic dish of the establishment “duck with blood” or “duckling Frédéric Delair”. 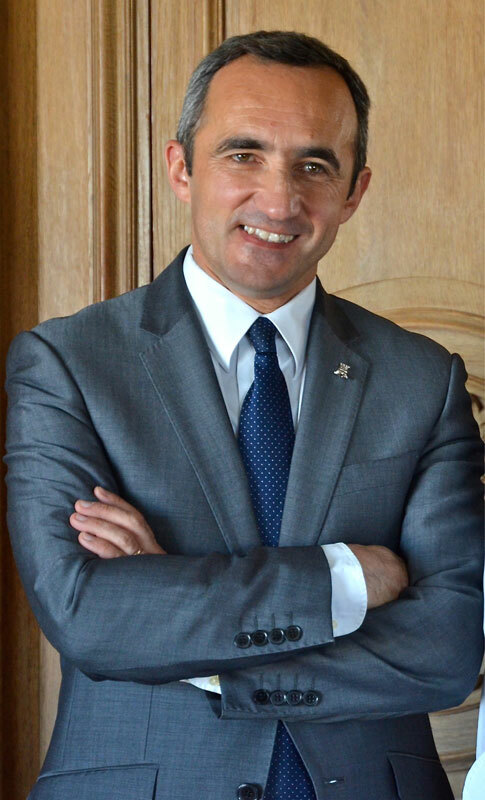 Stéphane Trapier, Director of the restaurant, explains “Born in 1890 under the leadership of Frédéric Delair, maître d’hôtel became owner in the mid-nineteenth century, this recipe is fully codified. It requires a very specific cut that requires to have very good knives. 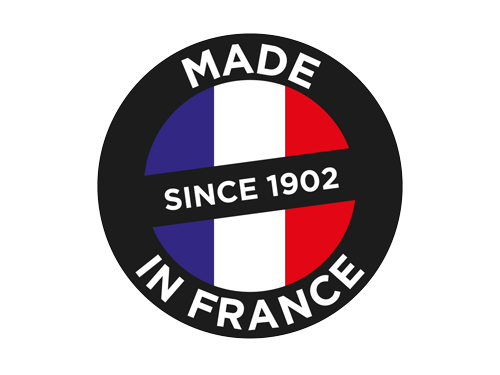 In the past, we had the opportunity to test the Dozorme kitchen knives through the Federation des Fromagers de France, which collaborates with the cutlery industry. The cutting edge and design of the Dozorme knives combined with the invaluable know-how of this century-old brand have immediately seduced us”. For the “Frédéric Delair duckling” cut, Stéphane Trapier chose two Dozorme knives with very specific characteristics: the 1902 and Haute Cuisine. Proposed with its handle in Rosewood, the 1902 kitchen knife has a fairly rigid blade that allows lifting the thighs. As for the Haute Cuisine knife, its blade more flexible allows precision work, ideal for lifting the breasts. These 2 Dozorme knives are also used for cutting lamb or foie gras. Knives of exception for exceptional products in a place of exception! It’s in an exceptional environment on Lake Geneva’s shores that we find the knives Claude Dozorme, within the very chic and very prestigious Royal hotel of Evian-les-Bains. 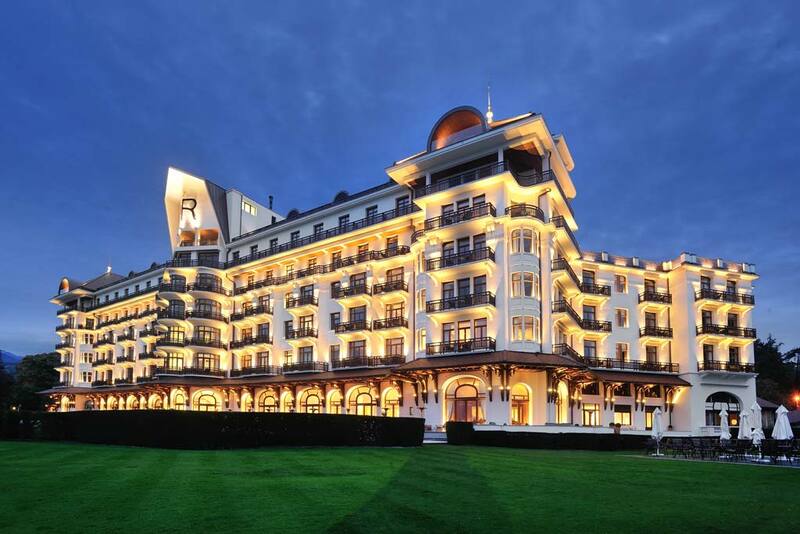 Located in the heart of a private estate of 19 hectares, the 5-star hotel, which received the Palace label in 2016, dominates the heights of Evian-les-Bains offering breathtaking views of Lake Geneva and the French and Swiss Alps. In this rare place of French luxury, the arts of the table must always be flawlessly. That’s why Dozorme cutlery is present in this sophisticated establishment, especially in Les Fresques restaurant. 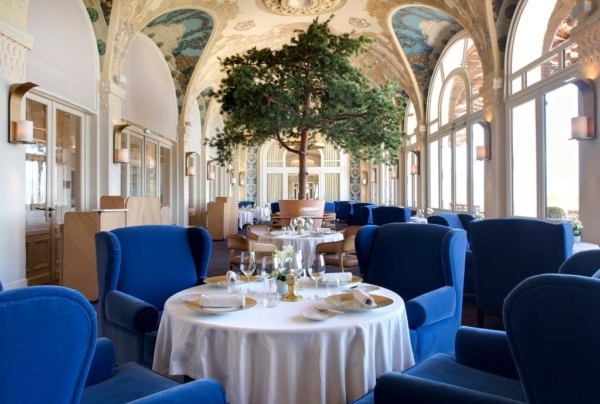 Recently awarded with a star in the Michelin Guide, the establishment offers an inventive and refined cuisine under the leadership of Chef Patrice Vander. On the menu, there are some classics, such as wild sea bream marinated in mango, wokame and caviar Osciètre, Bresse’s chicken, supreme studded foie gras with herbs and yellow wine or “dishes collections”. Here, the pieces signed Dozorme invite themselves on the tables, but not in simple knives laid on the tablecloth. The knives are proposed to the client, expertly staged in an oak cabinet. 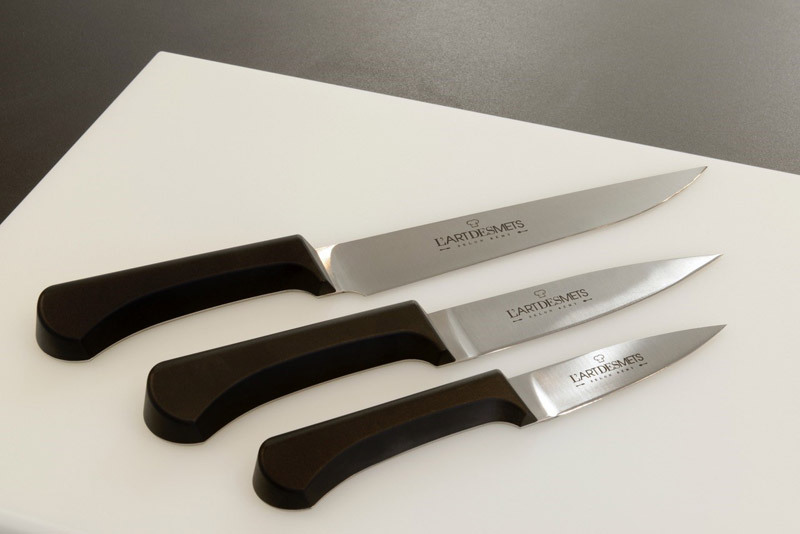 The customer has the choice between four table knives manufactured within the cutlery of Thiers: a Laguiole , a Le Thiers®, a Capuchin or a Shuttle 6.16. Proof of their success with a clientele accustomed to exceptional products, the establishment recently offers for sale, in its shop, the 4 models of knives that contribute to the reputation of the manufacture. For cheese service, everything is orchestrated in the rules of the art. 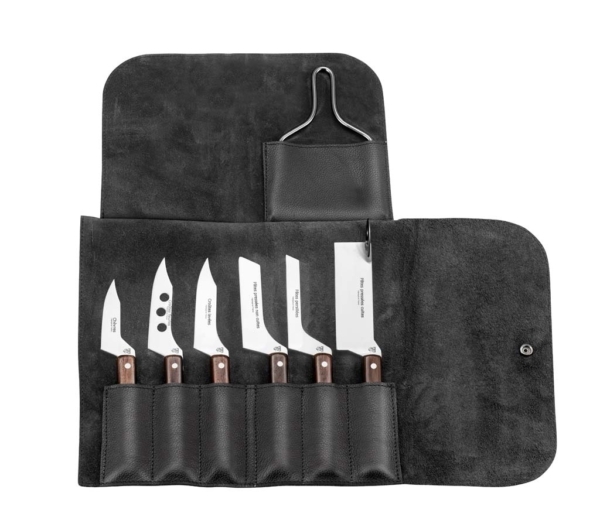 The establishment opted for the complete range of Dozorme cheese knives presented in an elegant leather pouch. So, whether they be soft, pressed, cooked, uncooked, marbled or goat cheese, with each cheese, a knife for a perfectly tailored cut. And the partnership does not stop there! Soon, the entire sommellerie team will be equipped with custom Dozorme corkscrews at the initiative of Loïc Chavasse-Frette, sommelier in chief. Finally, to deepen the cutlery knowledge of the restaurant staff, “cutlery” workshops will even be offered. For Sébastien Caquelard, Director of Operations in charge of catering “it goes without saying that through this partnership, the Royal Hotel is much more than just a prescriber but a true ambassador of French know-how embodied by the Dozorme cutlery. We are very proud of this collaboration, which is highly appreciated by our customers. We have very good feedback on Claude Dozorme knives. We are all the more pleased that this collaboration was set up following a visit by Claudine Dozorme, as an individual. In a totally impromptu way! “. After the Auvergne and Touraine, our gourmet tour of France takes us to Sologne and more precisely to Cerdon-sur-Loire. In this hunting area par excellence, nestles a restaurant of the most discreet evocative and symbolic name: The 2 Bécasses. Opened in 2015 and run by 2 women, Hélène Tubach and Sandrine Martinez, the establishment offers a cuisine based on fresh produce that is simple, traditional and seasonal. Focusing on local resources, the 2 Bécasses seeks to find the authenticity of a generous cuisine. No lack of taste in the room also where the decoration skilfully mixes vintage tommettes, exposed beams, walls of briquettes and lime plaster. A simple and authentic decor, just like their kitchen. And as here nothing is left to chance, every detail has its importance! Thus, the Laguiole table knives, signed Claude Dozorme, display an authentic woodcock feathers in their sleeve. The perfect final touch! 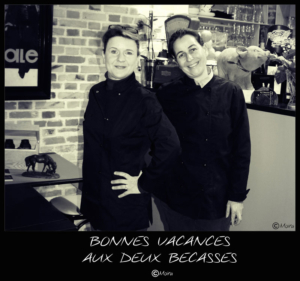 It must be said that the 2 friends and especially Hélène Tubach, know well, and for a long time, the manufacture from Thiers. Indeed, before embarking on this beautiful gastronomic adventure, the young woman worked for a long time as a journalist for various magazines. It was during her career as a journalist that Helen discovered the family cutlery and met the sparkling Claudine Dozorme. Pretty soon, she wanted to collaborate with the family cutlery for several reasons as she points out “In addition to offering beautiful knives, very elegant with a perfect edge, Claude Dozorme cutlery places quality at the heart of its concerns. Just like me with the restaurant. It’s really what binds us. ” A collaboration that is not ready to end! 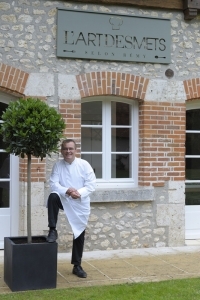 After Jacques Decoret of the restaurant of the same name, let’s meet Rémy Giraud from the Domaine des Hauts de Loire located at Onzain between Blois and Tours. This double-starred chef knows the Dozorme cutlery well since he uses his knives in his cooking school « L’Art des Mets ». 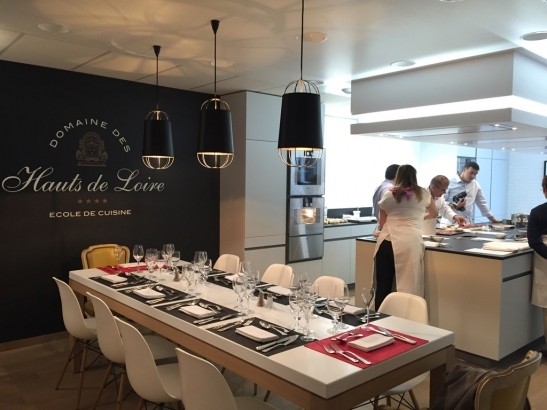 Remy Giraud remembers: “It was 4 years ago, I was looking for French-made kitchen knives for my cooking school when I met Claudine Dozorme at the Maison & Objet Salon. I knew then, of reputation, the city of Thiers and its ancestral know-how in the manufacture of knives of quality less the cutlery Claude Dozorme. So we met: after explaining my request, she told me the story of the family factory and introduced me to the various products crafted in the heart of his workshop near Thiers. I really could appreciate the brand’s knives “. His choice was immediately focused on the new range of kitchen knives imagined and designed by Thomas Bastide and named Flat Cut. What seduced him? The resolutely modern design of these kitchen knives and their originality with their asymmetrical shape and the inclination of the handle. And he doesn’t intend to stop there with the cutlery Dozorme! Proof of his great satisfaction for the kitchen knives of the brand, he plans to use now the table knives London in its new bistro-style establishment that will open shortly. 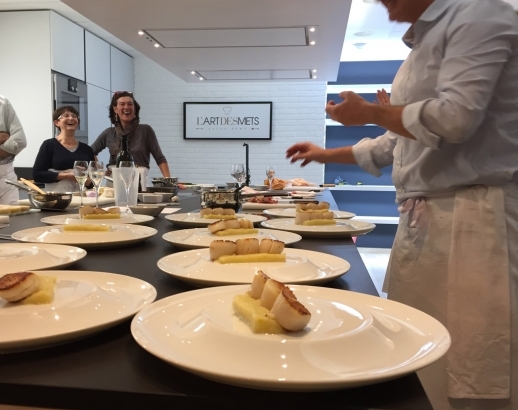 In the meantime, he is always proud to value the national gastronomy while promoting the art of the French table without stopping to pass on his knowledge to the younger generations! Who are you Rémy Giraud ? Originally from Vendée, Rémy Giraud arrived at the Domaine des Hauts de Loire in 1986 as a second. Two years later, he took the reins of the furnaces and obtained a first Michelin star and a second in 1993. A great recognition for this chef who had never previously worked for a starred table! A few years later, thinking about his end of career, he decided to create the Art of Mets, cooking school entirely imagined and conceived by his son, architect. In this semi-professional school “so that my students feel at home”, Rémy Giraud transmits his secrets and his knowledge and likes to value local products and local producers. Proof of their high quality and their design, table knives Claude Dozorme can been seen more and more on the most sophisticated tables in France and Navarre. 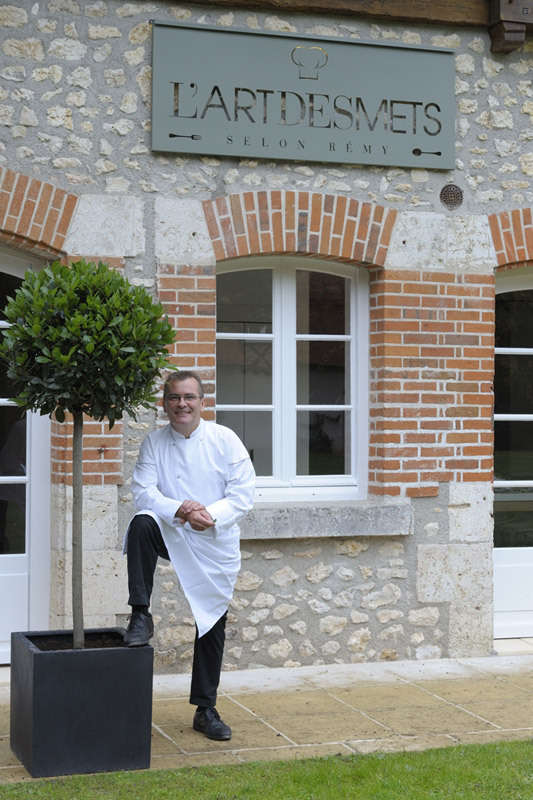 Today we invite you to meet Jacques Decoret, « Meilleur Ouvrier de France » and one Michelin star who use, for many years, the table knives “made in France” of the family cutlery. 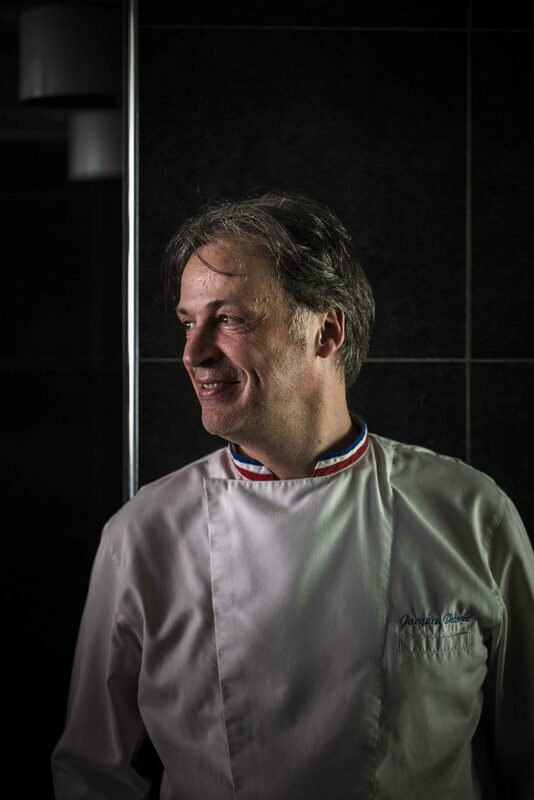 Settled in Vichy with his wife in a beautiful Napoleon III, Jacques Decoret has been the only Michelin-starred Chef in the Allier department for 17 years. 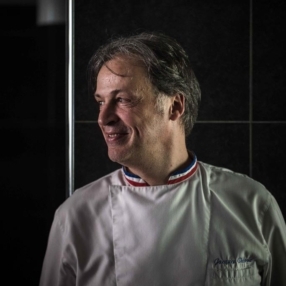 Elected « Meilleur Ouvrier de France » in 1996, he won the prestigious title of “Chef of the Year 2017” at the « Trophées de la Gastronomie et des Vins » on October 30th. True creator of taste, he has earned his stripes from the greats, from Jean-Michel Lorain to Régis Marcon, via Michel Troigros and Alain Passard. 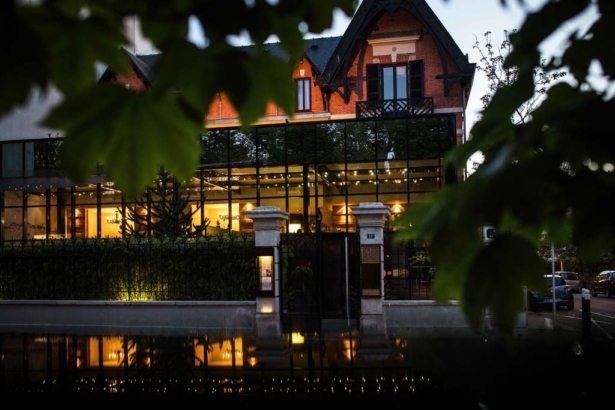 In his establishment « La Maison Decoret », the Chef sublimates a cooking unceasingly renewed and without artifice, capturing and revealing nature in its essence with associations of sharp and unsuspected flavors. Cookings are slow and perfectly controlled, textures magnify the product, sauces and juices are conceived like real infusions to privilege the delicacy. A real goldsmith work. To sublimate his daring, personal and extremely accomplished cooking, this maestro made the choice of cutlery Dozorme for his table knives and more precisely the Shadow designed by Thomas Bastide. 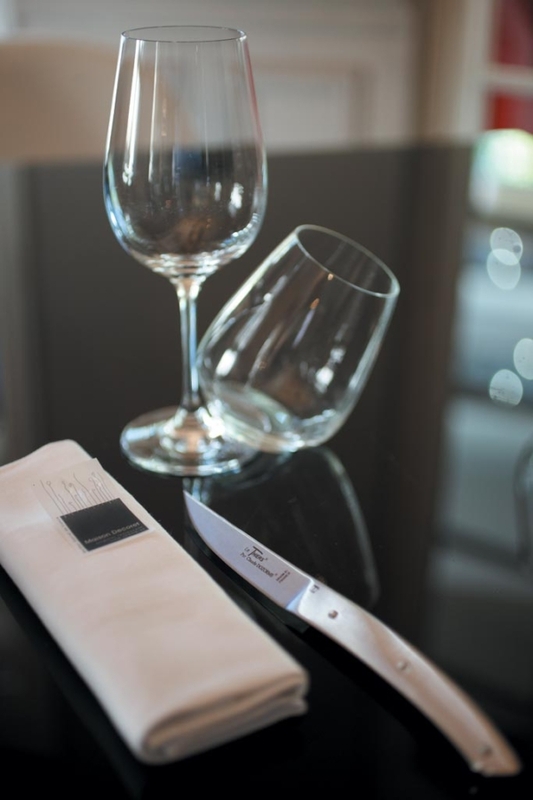 A Le Thiers® table knife by Claude Dozorme resolutely trendy and original in perfect harmony with Chef Decoret’s cooking. To satisfy taste buds and pupils!